The American Swing Jazz of the’30s and ‘40s, popularised by the great Broadway Shows and exported to a global audience through Hollywood Musicals, experienced a novel reworking in the hands of musicians from the Eastern European tradition. Often from gypsy backgrounds, these versatile instrumentalists injected a raw energy and joie-de-vivre to the dance-orchestra style, giving it a renewed urgency together with an interesting new harmonic direction. Relatively small ensembles featuring stringed instruments were at the forefront of this new style, which rapidly gained popularity, particularly in Paris, where it came to be known as ‘Hot-Club’. Many if not all new musical styles evolve by chance – the right instruments in the right hands at the right time – and so it was with Hot-Club. Gypsy guitarist brothers Django and Joseph Reinhardt were tuning up in readiness for a hotel gig. Violinist Stephane Grappelli began to weave some jazzy licks around their combined textures, and double-bassist Louis Vola joined in the fun. The potential of this innovative combination was immediately recognised – Hot-Club Swing Jazz had arrived. Swing jazz at its best is spontaneous and energetic. In Django and Stephane, two fantastically gifted exponents of their respective instruments, the genre reached new heights. The consistently high standard of their improvisation and the magic of their musical conversation comes down to us on vinyl, and there have been and no doubt will continue to be countless imitators. The Quintet left a mighty legacy to the world of jazz and music in general, and their influence will continue to be felt in the continuing work of their successors. Hot-Club Swing Jazz is alive and kicking! Parisian Hot-Club Swing Jazz is café music at its most entertaining – exuberant, light-hearted and joyful. As with many other jazz styles, a given melody or chord sequence is improvised upon, usually in alternating solos, by the participating musicians. 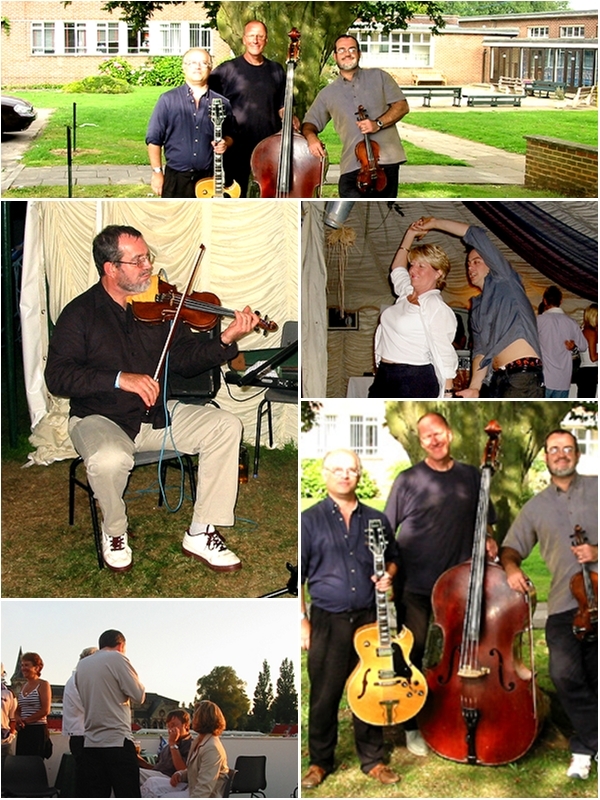 In the case of Hot-Club style, the principal instruments are usually violin and guitar, backed up by a rhythm section of a further guitar (or two) and double-bass. Other instruments can be included, clarinet or piano for example, but vocals, if they feature at all, are kept to a minimum. Le Café Jazz, hailing from the West Country, are modern-day exponents of this vibrant and hugely enjoyable style of music. Featuring violin and guitar supported by piano and double-bass, they play an engaging mix of standards from the ‘30s and ‘40s, alongside arrangements of more modern repertoire. However, they take much of their inspiration from the Hot-Club era. Le Café Jazz Are available for weddings, private parties and other events throughout the West Country and further afield.